Luke 6:20-31 Then he looked up at his disciples and said: “Blessed are you who are poor, for yours is the kingdom of God. 21 “Blessed are you who are hungry now, for you will be filled. “Blessed are you who weep now, for you will laugh. 22 “Blessed are you when people hate you, and when they exclude you, revile you, and defame you on account of the Son of Man. 23 Rejoice in that day and leap for joy, for surely your reward is great in heaven; for that is what their ancestors did to the prophets. 24 “But woe to you who are rich, for you have received your consolation. 25 “Woe to you who are full now, for you will be hungry. “Woe to you who are laughing now, for you will mourn and weep. 26 “Woe to you when all speak well of you, for that is what their ancestors did to the false prophets. 27 “But I say to you that listen, Love your enemies, do good to those who hate you, 28 bless those who curse you, pray for those who abuse you. 29 If anyone strikes you on the cheek, offer the other also; and from anyone who takes away your coat do not withhold even your shirt. 30 Give to everyone who begs from you; and if anyone takes away your goods, do not ask for them again. 31 Do to others as you would have them do to you. Today we sing with the saints. After all, it IS All Saints’ Sunday – a day that comes around every year and is celebrated in the wider church in all kinds of ways. Here is this place, with these people, we accompany the saints with our own singing as part of a larger remembering. Today we sing with the saints. We sing with the prophets of times gone by like Daniel – prophets who dream dreams and see visions during times when chaos seems to have free reign around the world; prophets who bring a God-drenched word of hope in confusing times with uncertain outcomes. But saints such as Daniel do more than bring a word of hope in the face of despair. It is their word but it is also their action in the power struggles of their times that move our minds but also our bodies into the struggle. Today we sing with the prophets – Daniel, Anna, Martin Luther King Jr., Mother Theresa and so many more who not only spoke but took their bodies into the struggle, and who inspire us to do the same. Today we sing with the saints. 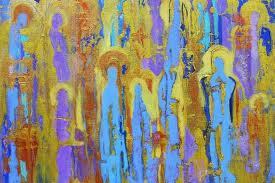 We sing with those saints described in the Psalm today – saints who carried the two-edged sword. We sing even as we wonder about the dangers of thinking ourselves on the faithful, and therefore on the right, side of any war. Today we sing with the saints of the two-edged sword – Joan of Arc, Dietrich Bonhoeffer and so many others who lived and died as warriors and as faithful saints. Today we sing the saints. We sing with the apostles of times gone by like Paul who wrote the Ephesians reading we heard today – apostles who encountered the risen Christ and were sent away from that encounter to speak the good news of Jesus. The good news that tells the truth about our flaws, our sin, and where Jesus meets us in all that flawed, flailing around. Or as Paul puts it in the reading today, “with the eyes of your heart enlightened, you may know what is the hope to which he has called you, what are the riches of his glorious inheritance among the saints.” Today we sing with the apostles – Paul, Thomas, Peter, Mary Magdalene and so many more whose stories of the risen Christ draw us into the hope of faith. Today we sing with the saints – the poor, the hungry, the crying, the lonely – these saints among us whose existence afflicts the more comfortable among us. The comfortable are afflicted by the people who reveal the Kingdom of God without qualification or contingency. The saints among us who bear almost all the weight of the most painful life experiences and who leave the others of us wondering what part we play in that poverty, benefiting from structures of power that create pain for others. Today we sing with the nameless saints who are poor, hungry, crying, and lonely even when our song should be silenced so that we can hear the suffering and do something about it. Today we sing with the saints – those people we know and love who died within the last year – saints who were part of this baptized community and saints who were connected to this baptized community in many other ways. We sing through tears of loss and grief as we mourn those who were with us for the briefest of days to the longest of lives. Today we sing with the beloved saints whom we name as we remember their time with us and as we cling to the promise of joining them when we too will die and pass from this life to the next. Today we sing with the saints next to us in the pew – family, stranger, or friend. You heard me right. You, me, them…saints. We ourselves and those people sitting next to us are deeply flawed people, sinful people, who by the very grace of God in Christ Jesus are at the same time beloved saints. Right here and right now we are one hundred percent saint and, at the same time, one hundred percent sinner. This is the radical calculus given and revealed in each one of us. And I can say with clarity that is not I who live but Christ who lives in me and it is not you who live but Christ who lives in you. It is this Christ who presents us as saints to the eternal God and as saints to each other in the here and now. Today we sing with the saints. Thanks be to God. Daniel 7:1-3; 15-18 In the first year of King Belshazzar of Babylon, Daniel had a dream and visions of his head as he lay in bed. Then he wrote down the dream: 2 I, Daniel, saw in my vision by night the four winds of heaven stirring up the great sea, 3 and four great beasts came up out of the sea, different from one another. Psalm 149 Praise the Lord! Sing to the Lord a new song, his praise in the assembly of the faithful. 2 Let Israel be glad in its Maker; let the children of Zion rejoice in their King. 3 Let them praise his name with dancing, making melody to him with tambourine and lyre. 4 For the Lord takes pleasure in his people; he adorns the humble with victory. 5 Let the faithful exult in glory; let them sing for joy on their couches. 6 Let the high praises of God be in their throats and two-edged swords in their hands, 7 to execute vengeance on the nations and punishment on the peoples, 8 to bind their kings with fetters and their nobles with chains of iron, 9 to execute on them the judgment decreed. This is glory for all his faithful ones. Praise the Lord! Ephesians 1:11-23 In Christ we have also obtained an inheritance, having been destined according to the purpose of him who accomplishes all things according to his counsel and will, 12 so that we, who were the first to set our hope on Christ, might live for the praise of his glory. 13 In him you also, when you had heard the word of truth, the gospel of your salvation, and had believed in him, were marked with the seal of the promised Holy Spirit; 14 this is the pledge of our inheritance toward redemption as God’s own people, to the praise of his glory. 15 I have heard of your faith in the Lord Jesus and your love toward all the saints, and for this reason 16 I do not cease to give thanks for you as I remember you in my prayers. 17 I pray that the God of our Lord Jesus Christ, the Father of glory, may give you a spirit of wisdom and revelation as you come to know him, 18 so that, with the eyes of your heart enlightened, you may know what is the hope to which he has called you, what are the riches of his glorious inheritance among the saints, 19 and what is the immeasurable greatness of his power for us who believe, according to the working of his great power. 20 God put this power to work in Christ when he raised him from the dead and seated him at his right hand in the heavenly places, 21 far above all rule and authority and power and dominion, and above every name that is named, not only in this age but also in the age to come. 22 And he has put all things under his feet and has made him the head over all things for the church, 23 which is his body, the fullness of him who fills all in all.